Creating Competitive Advantage Through a Digital Supply Chain - Infosys Consulting - One hub. Many perspectives. The rapid rise of innovations and operational evolutions such as Industry 4.0 are ushering in a profound new era of the digital supply chain. 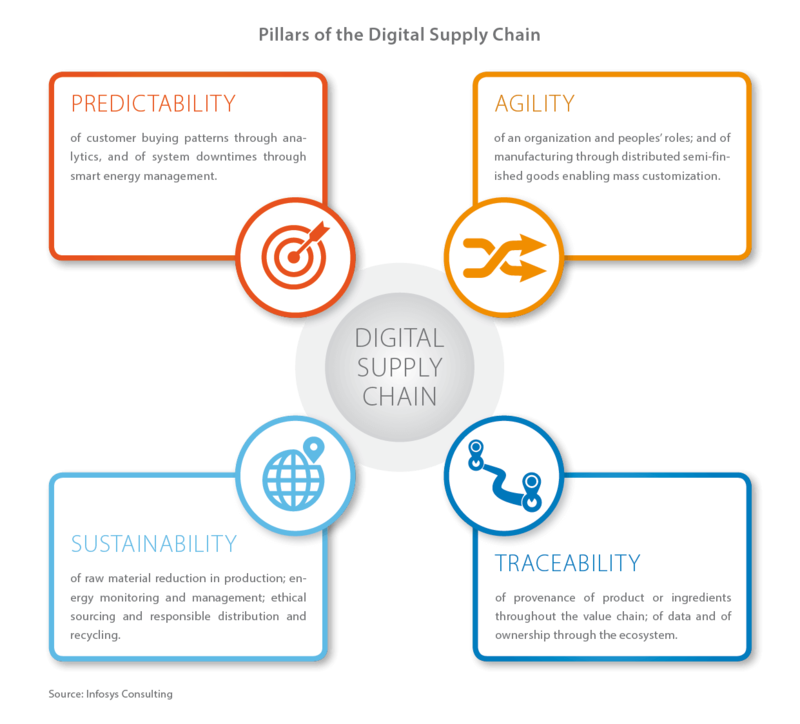 A well-architected supply chain model is anchored in four key pillars – namely predictability, agility, traceability and sustainability – which serve as critical enablers that more and more organizations are striving for as they reinvent their ecosystems. These pillars can enable better visibility of data, which in turn provide supply chain transparency across the entire value chain of an organization when implemented effectively. With transparency comes a host of benefits – including the ability to achieve medium- and long-term sustainability goals. In our expert view, the firms that get this right will be well-positioned for lasting competitive advantage and a market-leadership role in the future. 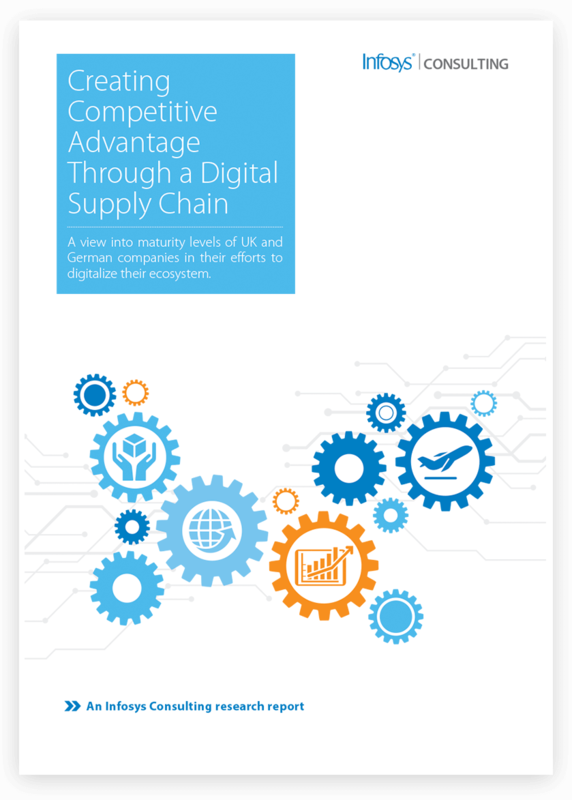 This exclusive report analyzes the varying maturity levels of large UK and German companies (with 5,000+ employees) in their ongoing efforts to digitize their supply chains – with a focus on sustainability and transparency drivers. We will also explore some key technology implications and approaches for your organization to consider in its journey forward. Technology has infiltrated every aspect of our consumer lives, so it follows that it is also causing a major shift in manufacturing and the supply chain. From the ‘smart factory’ or digital twin to the ‘smart home’, cyber-physical systems are interacting seamlessly through the Internet of Things. Accelerated digital transformation is at the heart of crystalizing the fourth industrial revolution, or as popularly known, Industry 4.0, and the manufacturing sector is poised to benefit significantly from it. Previous industrial revolutions have brought huge opportunities to businesses, but also a number of challenges. Regardless, these past developments have shown that organizations which don’t embrace change early will risk becoming irrelevant and will simply struggle to remain competitive as others leapfrog ahead. According to our recent survey, UK and German businesses recognize the importance of embracing Industry 4.0 principles, with 79% claiming to be partly digitized. Further, one-quarter of German companies claim to be fully digitized, compared to only 5% of UK companies. This shows organizations have a long undertaking ahead in their journeys to have a strong, end-to-end digitalized ecosystem throughout their supply chains. The majority of UK and German senior business decision makers (71%) believe that the ability to respond to changing consumer demands is a lot more important today than it was five years ago, and will continue to increase in importance. This can be attributed to this new era of mass-customization, where technology is enabling consumers to tailor and order products to their exact specification in real-time. This is creating a significant acceleration of new trends taking flight, and thus opening major new markets for organizations to capitalize on. It is clear we no longer operate in an era where ethical business practices are a “nice to have” and are viewed by the CFO as a cost center. But rather, it’s become a core tenet of business strategy today, and one that can add economic value for organizations that embed it in their culture. However, according to our research, 38% of UK and German senior business decision makers still do not see ethical consumption as having increased in importance over the past five years, and the same number do not see it increasing in importance over the next five years. 25% of German companies claim to be fully digitized compared to 5% of UK companies. 50% say that digitization of the supply chain has had a positive impact on profitability. This is further supported by a World Economic Forum report, which states companies pursuing ethical policies could increase revenue by up to 20%, decrease supply chain costs by up to 16%, strengthen their brand value by as much as 30% and reduce their carbon footprint by some 22%. In order to remain competitive today, implementing sustainability practices is not optional, but an imperative. How Does Industry 4.0 Advance Traceability and Sustainability in Supply Chains? 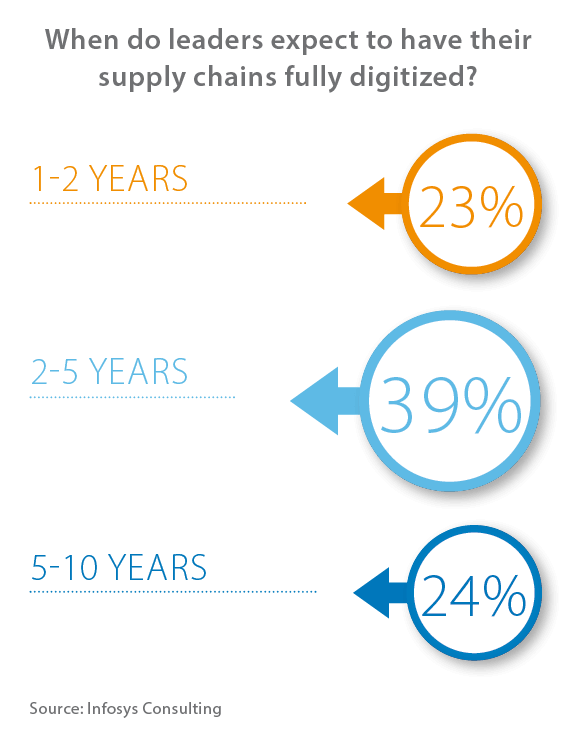 Almost a quarter of respondents cited transparency as the least important aspect in their supply chain. This is surprising considering that consumers are demanding more end-to-end transparency in the products they buy, which means that supply chain managers have to ensure that there is more visibility and traceability practices implemented into each step of their logistics operation. This can have a direct impact on image and value for brands. Likewise, manufacturers are seeking deeper and better-connected visibility into parts and supplies they procure, as this enables supply chain officers to achieve better predictability in their planning efforts. Additionally, business leaders are striving more and more to reduce their carbon footprint and costs – this can be achieved by clear per-unit production spend through accurate energy monitoring and management. Companies need to know who their suppliers are beyond the first tier. Further, there are elements relating to environmental standards, product safety and the treatment of workers where businesses need to be fully transparent across the entire supply chain. This is a complex task and one that is near impossible to achieve without a highly-digitalized supply chain. In an increasingly competitive world, integrating sustainability pillars – and therefore traceability practices – into the fabric of a digital supply chain, businesses can create competitive advantage and perhaps strong economic ROI when done successfully. Supply chain legislation and business reforms present a challenge to Industry 4.0, and therefore to ethical consumption – all of which cannot be overlooked. As consumers ask tougher questions about where their goods come from and who made them, governments are responding with more stringent regulations forcing disclosure of product and supplier information. The same is true on the B2B side. In recent years, laws such as the Modern Slavery Act in the UK have forced brands to take responsibility for working conditions throughout their entire manufacturing supply chain. Similarly, the introduction of the EU Directive on the Disclosure on Non-Financial and Diversity Information (Directive 2014/95/EU) means that some 6,000 large companies across the EU are now required to report on their environmental and social impacts. For many organizations, legislation is merely a reinforcement of established voluntary reporting standards, such as the Global Reporting Initiative (GRI). As far back as 2011, a report from KPMG showed that 95% of the 250 biggest companies in the world disclosed sustainability performance information. Codifying these standards into law has raised the stakes however, necessitating a comprehensive and strategic approach by companies to ensure compliance and shield themselves from potential legal, financial and reputational exposure. Accordingly, our research shows that 84% of senior decision makers say new legislation has become an increasingly important factor influencing their strategy for ethical sourcing in the supply chain over the past five years. The same is true for transparency, where 83% of respondents cite new legislation as an increasing driver for change. Digitization provides a clear pathway to achieving the goals of transparency and traceability across the supply chain. Key stakeholders overwhelmingly agree digitization provides a clear pathway to achieving the goals of transparency and traceability across the supply chain. But digital transformation to industry 4.0 also opens up avenues for data theft, industrial espionage, and attacks by hackers. If businesses are to fully reap the benefits, they will need to balance openness and transparency with robust and consistent information security right across the supply chain. Given the careful balancing act businesses must strike, it is not surprising then that 25% of respondents identify digital security as the most significant barrier to achieving their future operational goals. Respondents in both Germany and the UK rank digital security as the second biggest hurdle they must overcome, just behind the need for investment in skills and expertise. It is easy to see why this is the case when hardly a day goes by without reports of another high-profile cyber-attack hitting the headlines. Awareness of the risks may be high, but problems persist, with hackers frequently exploiting vulnerabilities in the supply chain to access personal data. Governments have taken action, and our research reveals some telling insights into the role that legislation is playing in driving digital security up the corporate agenda. In Germany, where stringent laws on data protection have been in place for some time, it is notable that nearly a quarter (23%) of senior decision makers regard legislative compliance as one of the three main challenges they have needed to address when digitizing their supply chains. The introduction of the General Data Protection Regulation (GDPR) in 2018 requires a similar level of due diligence and reporting from companies across the globe. So it is surprising that just 11% of UK respondents see legislation as one of the challenges they have faced in trying to digitize the supply chain they manage. Businesses today face significant external pressure to do the right thing, and in most cases, additional legislation is merely a rubber stamp for the best practice they have long shown through voluntary certification. Legislation performs an important role, however, in clarifying where the responsibility lies for ensuring best practice. It also ensures there is recourse for action if a company is shown to be negligent. For businesses operating complex digital supply chains, failure to deliver transparency and consistency at every level of the supply chain now has consequences beyond reputational damage. Whether we’re talking about GDPR or the Modern Slavery Act, throughout these regulations and initiatives are two common threads: disclosure and due diligence, both of which require increased knowledge about the supply chain and the origin of products and services. Companies’ procurement strategies need to fully embed these new expectations and requirements by integrating due diligence measures at the core of the procurement process. How can an organization provide transparency for provenance or ethical sourcing for consumers, and add 5% to profits? How can one produce and deliver sustainably for stakeholders and save 2% annually on energy and consumption costs? Questions like these are at the heart of what is driving our clients, and many of our survey respondents, to consider a radical new approach to their supply chain efforts. For supply chain and operational leaders of the past, the biggest technology decision was which ERP solution to implement and how much to customize it. Today, the array of technology available to address business challenges as outlined in our research is vast and overwhelming. • What business challenge am I trying to solve? • Where can my organization generate the best return on investment (either through cost reduction or increased profit)? Focusing on these over-arching drivers will first lead more naturally into the technology selections. Then, an exploration journey of proofs-of-concept will help create a future-state view of the possibilities and applications to your organization. Robotic Process Automation >> can enable and power better flexibility. AI and Analytics >> can aid in predictability and energy efficiency efforts. Blockchain >> can power traceability through the supply chain. With blockchain, proofs-of-concept are helping some early-adopter companies to reduce costs, power faster transactions, lower risk levels and improve collaboration efforts across their partner ecosystem. Our 2018 3rd Party Logistics Study confirmed that blockchain is gaining significant attention across the logistics space, which is a key component of any organization’s supply chain. In the end, however, the human element of trust is as much part of this new economy as is the technology. Understanding the ever-evolving technology landscape – and applying the right combination of people, process and data to it – will allow an organization to answer the much larger challenge of how to drive financial return and achieve lasting competitive advantage. Finally, consider a partner to help you prepare and plan in a smart way. Whether an industry consultant, supply chain strategy firm, or a technology partner, having the right team and expertise to advise you on your journey can offer great impact before you make bigger investment decisions. As partner and UK supply chain practice head, Jonquil defines the go-to-market strategy for digitally-focused market offerings - and leads strategic change and complex supply chain transformation programs for the CPG and manufacturing industries. 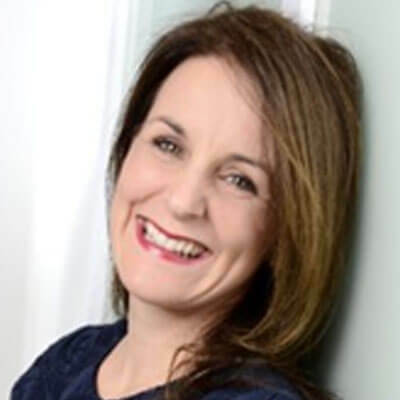 She is passionate about people, ardent about leadership and about developing high-performing teams with a sense of purpose, internally leading all coaching initiatives for the UK. As an educationist, she is committed to learning and growth – reflected in her part-time role as a lecturer at Beuth University, Berlin, and in her authorship on sustainability and renewables in Industry 4.0. She possesses an MBA from Beuth University and is fluent in German, English and Spanish. She is a special contributor and subject matter expert to this paper.